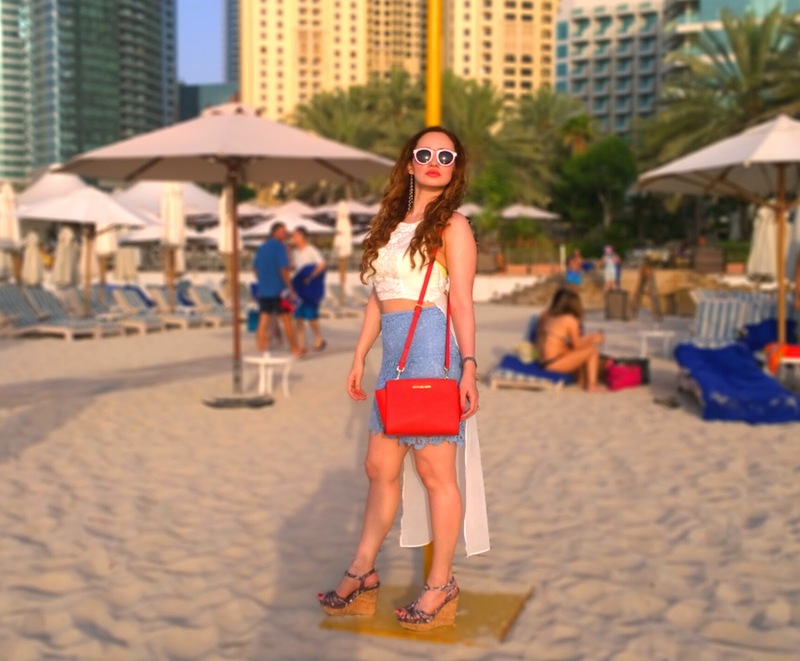 Beach Babe OOTD – Dubai Diaries 1 ! Hey lovelies, I’m back from my birthday holiday to the exquisite city of Dubai. It was my first time visiting this Middle-Eastern city and I was so delighted with my experiences there. Dubai has a real kaleidoscope of attractions , but since I’m such a beach bum, I spent most of my time at Dubai’s stunning beaches. 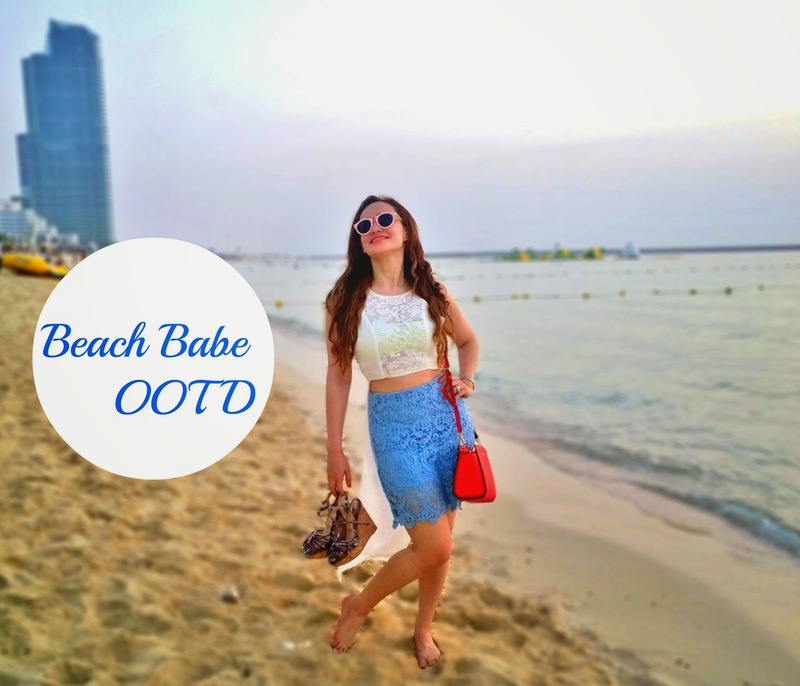 I shot my first outfit post at the city’s most popular beaches ‘Jumeirah Beach‘. I was stunned by the white sand, pristine blue water, the wonderful restaurants & hotels lining the beach serving some exotic Lebanese,Continental & World cuisine. My look bordered on chic resort wear, with this white high-low top with a sheer lace panel in the front & a cross-back paired with this pastel blue high-waist crochet skirt.The top is the perfect fit for hot summer days at the beach, comfy and chic. Pastels are a summer staple and this crochet skirt is the prettiest shade of pastel blue. I kept the jewelry minimal for the beach with just this one statement piece- these dangling pearl ear-cuff with a single spike drop. 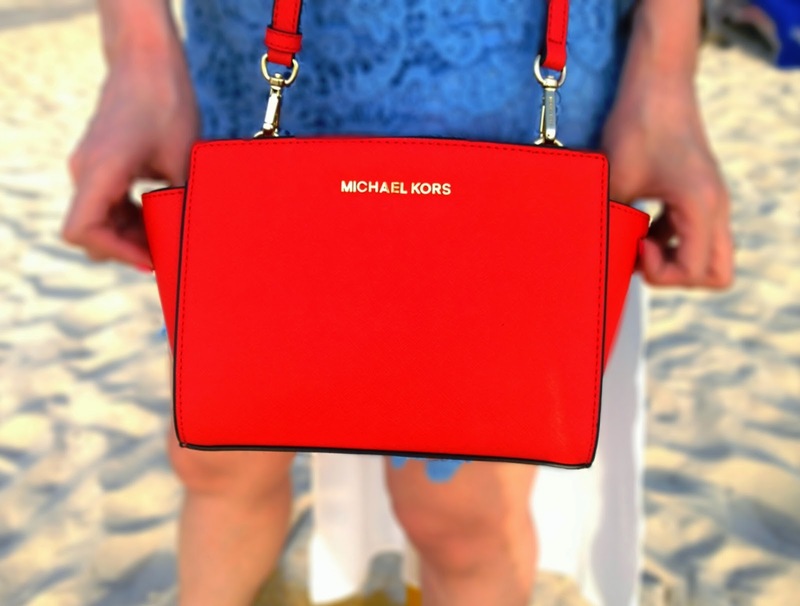 I wore these cool retro pink Sunnies, carried my new Coral Red Michael Kors bag and donned my strappy wedges with a snakeskin pattern top and wooden bottom. I loved lounging around on the beach in this summer breezy outfit and prancing around bare-feet in the white sand . Hope you all enjoy the pictures from my Dubai Vacation ! More to come ! Stay tuned ! I totally love what you are wearing. You look super stunning. Love the bag and the style is beautiful. ha ha! cute! you look like a 70s beach babe with the crop top and heels. I have never been to the beach or laid eyes on the ocean, so i'm loving these pictures. how i wish i could go! Amazing lace outfit! You look stunning! Gorgeous skirt and top! The pictures are so beautiful! Wonderful and such a beautiful setting. Colourful lace is perfect for the season. That outfit is perfect for beach! Looks amazing! Loved the wedge heel you wearing!!! Beautiful lace set and you look super fabulous on the beach! Definitely rocking this summery look! You are looking awesome. The lifestyle of Dubai is great. That's why I like Dubai so much. The overall view of Dubai on your back is very beautiful. That outfit is perfect for beach! Looks amazing! Loved the wedge heel you wearing!!! – See more at: For escorts Websites .. This is really great news. Thank you for sharing it with us!